All focal persons expressed disagree on the currently published ‘Programme Performance Evaluation (FY 2066/67)’ of MoHP. 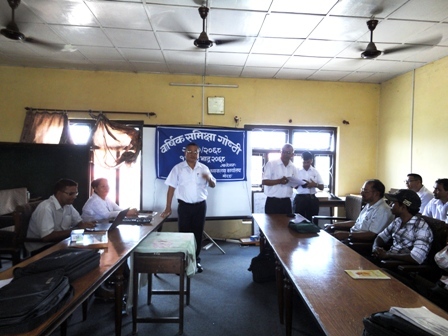 Today in a meeting held at DPHO Morang, supervisors said the evaluation process is unscientific and biased. HMIS focal person showed the pieces of evidence that they have sent all reports by e-mail in time except one month (1 day late in Kartik due to Tihar festival) but MoHP has given marks 2.5 out of 5 for Morang district. It is notable that the evaluation has given weight (20%) solely on recording and reporting which has encouraged districts to make good reporting rather than good coverage and access to the programmes. The responsible division says as its limitation, however, evaluation is failing to show the real picture of districts due to the paper dependent evaluation process. Since it is ‘Programme Performance Evaluation’ its result seems far from the real situation of the districts, so the impact of the Public Health intervention has not been measured as expected.